Knowing the TYPE of music tuition you are getting, will help you decide how much time your child needs to practice at home. For most families music lessons will slot in as an extracurricular activity. Unless your child is getting music lessons as part of their schooling curriculum, most likely you’ll be taking 30min private music lessons once a week. Aside from the 30min weekly commitment and anywhere between $100 – $140 in monthly fees, there’s potentially one more commitment your family has to make – that of PRACTICE. How much will your child need to practice? That depends on the choice you make as a family, and whether you want the music lessons to be “recreational” or “academic”. Let’s explore what this means. It’s not uncommon for music lessons to start with enthusiasm and end in battles over the child refusing to practice at home. In order to keep your child’s motivation high, you need to be better informed about what KIND of lessons you’ve signed your child up for. What KIND of lessons are RIGHT for your child? The are generally two types of music lessons. Let’s call them the two extremes. The two opposites of the “music lesson spectrum”. These are: recreational and academic. Most guitar lessons fall into the recreational category (you’ll see why later) and most piano and violin lessons fall into the academic category. This is of course a generalisation, but one you need to be aware of. For example while over 95% of guitar lessons for kids fall into the recreational category, Gentle Guitar™ lessons fall into the academic category. This means that our expectations from you and your child regarding practice and commitment are higher than what you’d see from most other guitar teachers. 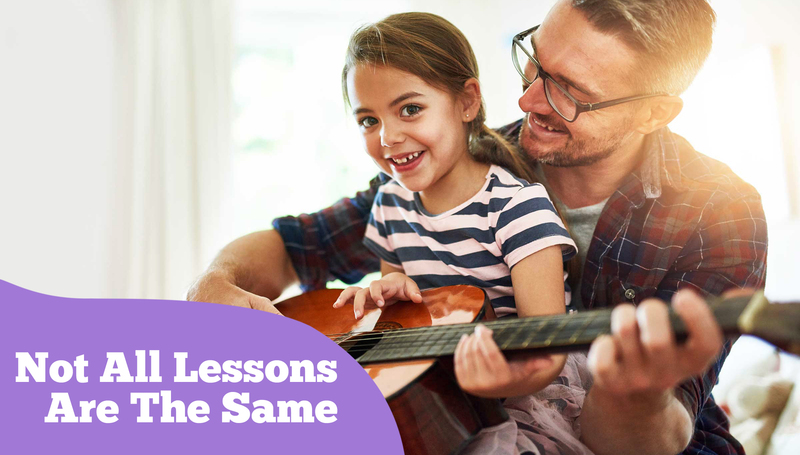 That’s an important distinction that many families are not aware of when they sign up for music lessons, and as a result many end up with the WRONG teacher and a rather stressful experience. This is because what you expect from the lessons may not be what your teacher or your child is expecting from the lessons. Conflicting expectations often end up in tears, fights, and the child giving up on music all together. It’s NOT worth it not to be informed and by a mistake choose the WRONG type of music tuition for your child. To make the RIGHT decision, you must first understand the key differences between recreational lessons and academic lessons. The teacher expects to teach a good work ethic, fundamental musicianship, music theory, reading and writing of standard music notation, correct playing technique. This foundation is taught in a gradual and progressive manner, which eventually (in 1-3 years depending on the age of the child) results in the child having relative fluency on the instrument and the ability to play their (and your) favourite songs very impressively! The teacher expects from you that the child will practice at least 15 minutes daily, 5 days a week. You are paying for lessons, so you are expecting that your child will make musical progress. You’re not expecting a virtuoso performance, but you are eagerly waiting when the whole family can sing along to some tune you all can recognize. But what you REALLY care about is that your child is enjoying music and is having fun. The child massacres Mary Had A Little Lamb after 8 months of lessons, and when you ask them to play something they give you a blank stare.“I can live with that”, you tell yourself, “if ONLY she was enjoying herself… But lately, it’s been an ordeal even to get her to practice.” Once she begged you for lessons, now she’d rather wash the dishes or take out the garbage than practice guitar. “You might as well stop!”, you tell her. Why pay for something she’s not enjoying anymore? But she doesn’t want to stop, she still wants to do it but she refuses to practice and sometimes even refuses to have the lesson. Go figure! Depending on her age she may have very different expectations. If she’s under 8, any new activity is a novelty and will excite her. If she’s over 9, she’s likely motivated to play like someone she saw on YouTube. But regardless of age all kids want to be GOOD at what they do. Just like adults they want SUCCESS. They want to LIKE the results they get on the FIRST TRY because being good releases “feel good chemicals”. Endorphin, oxytocin, serotonin, and dopamine – yes please! Your child wants instant gratifying results because it feels good and because they are kids and haven’t yet learned that sometimes the things that feel good need to be earned with patience and consistency. The first time she strummed the guitar it made her feel good! She learned a note or two and that was fantastic! Fast and easy! Boom – I can play guitar! Everyone praised her, but most important SHE FELT GOOD and wanted MORE! But the next week she learned two more notes, and because she hadn’t practiced all that much, the notes from the previous lesson got a bit rusty. She now has 4 new notes instead of 2. Where 2 notes was easy and fun, 4 notes is difficult and discouraging. She’s not “good” at it anymore, but she keeps trying because she knows that she CAN be good at it AGAIN. This pattern repeats and the child gets more and more frustrated and overwhelmed. There’s more new stuff thrown at her every week. Some of it is fun, but most of it has gotten hard and she feels like she’s falling way behind and failing all the time. Failure feels horribly desperate and demotivating. It releases all the “bad chemicals”. Your child gets stressed, worried, she doesn’t want to feel like a “failure” so she keeps trying, but at this point she’s in too deep and everyone’s on her back. The teacher is disappointed because she hasn’t practiced, you are getting impatient and threatening to stop lessons… She doesn’t want to stop… she just wants to be GOOD at it, but she doesn’t know how…. it’s not easy anymore. She needs help. But when you try to help, she pushes you away! Sadly, mismatched or misunderstood expectations is the BIGGEST problem because it results in a lack of practice and progress and is the #1 reason why smart and talented kids quit music lessons or jump from instrument to instrument only to end up in the same vicious cycle. The “practice problem” CAN BE SOLVED. Furthermore, once the child LEARNS TO PRACTICE she’ll unlock a super-power she never knew she had! And she’ll eagerly apply it to all other subjects and disciplines in her life. You might be very surprised that once she “cracks” music lessons, she’ll suddenly bring all “A’s” on her report card. How cool is that? This is REAL and possible once your child unlocks the secret to effective learning. In this series of articles I am going to show you how YOU can help your child unlock a love of learning so that she feels GOOD about practicing and enjoying her instrument of choice. Keep reading to find out the solution…. But first, you might want to consider recreational music lessons. Perhaps recreational music lessons are the right choice for YOUR family after all? This teacher knows that 95% of families with kids don’t practice ENOUGH at home. Either because the child is too busy with other extracurricular activities or simply because from experience the teacher knows that kids don’t practice correctly when left to their own devices. So he offers “recreational lessons” to kids under the age of 12. He’s not teaching musical foundations or theory, he’s not too concerned if your child’s playing with poor technique that could instil bad habits, he’s not trying to teach her how to read or write music (because she won’t practice anyway). So what are they doing? Most likely he will teach 5-10 easy chords and then he’ll play her favourite songs as she pretends to play along. Everyone’s having fun and it doesn’t matter that the lessons are a baby-sitting service with singing and dancing as a bonus. (This is not a critique of this style of teaching. It is a useful style of lessons for busy families who want minimal commitment but still some exposure to music. Many teachers choose this style of teaching when they offer lessons to very young kids, because they want to make the lessons fun for the child. They mindfully and selectively disregard the musical component in order to offer music exposure and music socialisation.). The student still wants to be GOOD. In recreational lessons she is not set up for failure because she is not really challenged. So she keeps having fun even though the lesson is more of a social interaction with hopefully a kind teacher and a great role model. The child will keep having fun as long as the teacher is entertaining. As you can see there are two VERY DIFFERENT ways for kids to have guitar lessons. Over 95% of guitar lessons for kids under 10 are recreational in nature for the very obvious reason that it’s EASIER for everyone and it keeps kids in lessons. At Gentle Guitar™ our focus is on academic music lessons for kids. I don’t want to make the other guitar teachers sound unprofessional, many of them certainly are highly professional educators and guitarists, it’s just that MOST of them choose not to teach music to kids “academically” due to the fact that kids simply won’t practice and this will create a frustrating situation at home and during the lessons and the child will very quickly quit the tuition. The recreational approach seems to be a WIN/WIN, but is it really? I will let you make up your own mind. Now that you know the difference you can talk to your child and your family and decide whether the recreational or the academic approach will work best for your child. But before you do, let me offer you more food for thought. In the next article we’ll talk about all that your child will be missing out on if you decide to go the recreational route. In the article after that, I’ll share what Gentle Guitar™ families do in order to make the academic approach to guitar lessons work for them. I’ll share a proven strategy for how you can motivate your child, even as young as 5 years old, to practice daily and ENJOY the weekly lessons with your teacher, as well as the work that has to be done at home.